They DO grow up fast, you are right about that Maddy_harper! 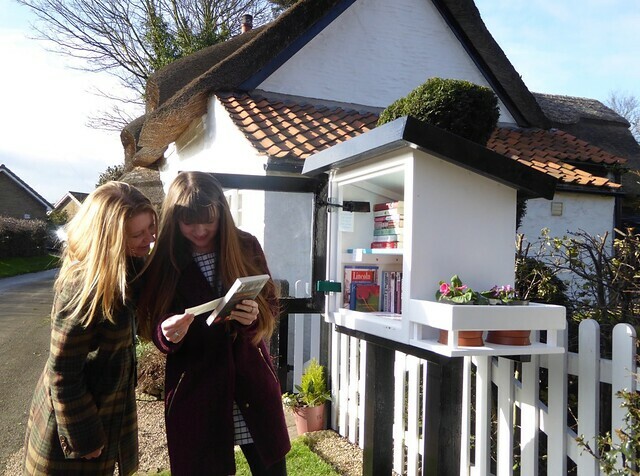 Here are some of the Little Free Library today - with some 'borrowers'! We are so excited about it! There's a FB page (Appleby Little Free Library) and it's on the village website (if anyone is interested)! 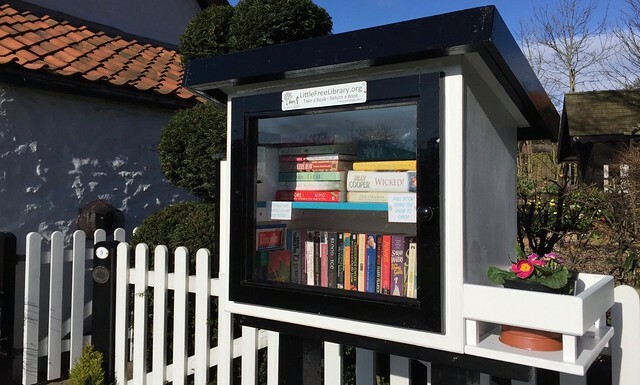 There are many, many more Little Library in America, but it seems to be catching on here too now! very deluxe and adorable Little Free Library. I love that everyone designs their own so they are very individual. I love the roof and the cottage look. It is so quaint. Wish we had them here. It is a great idea! It looks like such a friendly library! Cute! Alden had a little free library (I dunno if she still does). Betty looks like she's going to grow up to be a substantial sort of pig. what breeds are your pigs sweets? Can anyone help out with the picks? Chocks a teddy pig and as his breed suggests hes very cuddly and soft natured. They are mostly mixtures of different breads I think. Betty is mainly Swiss though. Flo is long haired, we trim her, like a Sheltie or similar! I am not very good at breeds! Substantial is just the right word for Betty, clairey!!! I think Marigold (not pictured) was a texel. She had the most fantastic coat I've ever seen--I would have loved to have cuddled her. Mariella, one of the most beautiful pigs who ever lived,was a sheltie. aww they all sound so sweet. I am alergic to long haird animals so i tend to go for short or mid length coated animals. still i had a alergy to my seeing eye dogs coat and her hair wasnt long at all. The issue with her was she shed a lot and the build up use to make my lungs and chest rattle something terible as i am asmatic too which never helped. wow Betty has certainly blossomed but am sure that's all fuff. Also congrats on setting the free library. What a great idea. that is a nice idea. Are my eyes playing tricks on me or are there 2 pigs on the cottage roof? Oinker pigs NOT wheeker pigs! It's hard to tell, but I think they might be foxes or dogs, if they are not pigs. I can't quite tell from the angle, but I think that they used to have an owl and a pussycat on the roof. 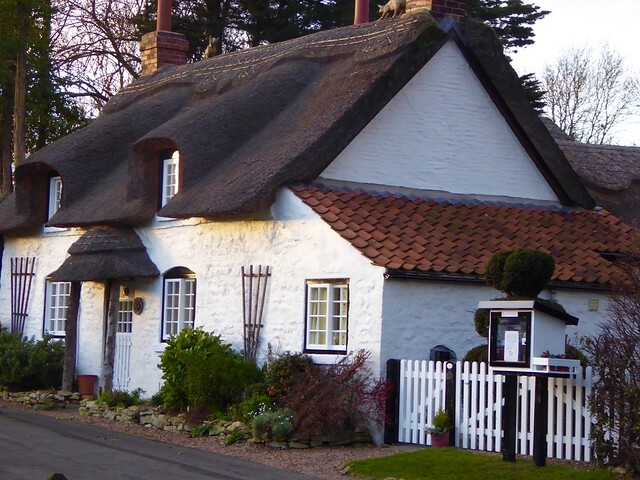 There were some lovely photos posted when the roof was getting re-thatched. in a beautiful pea-green boat..."
I looked at the Little Library website & found there's one just a few miles away. I had to take some hay my pigs won't eat to a wildlife rescue nearby & was going right past the street. Took a little detour & there was the Little Library. So cute. They're a fantastic idea aren't they?! I wish I lived in an area more suited to them. But, we do have a few pubs in the area that has a book swap shelf. Actually the pub I'm going to tonight has one so I'll take along a book or two! That works! Really, any venue will do the job. Our library has a set up where some of our deleted books are available at certain non-library locations (can't remember exactly where) with take home & return on the honor system. It's no big deal if we don't get the books back at all since they're deleted. The first thing that popped into my head was how do you get the post into the ground firmly. I'm not handy at all. 'Course, I'm 5 min. away from the library where I work & at our branch alone we have several thousand books. But in spite of good library service in our metropolitan area, there are bunches of Little Libraries around according to the website map. It IS the owl and the pussycat on the roof! I read the poem to Ian when we got married!!! Fancy that! A Little Free Library near you, Bookfan! Fab!! The posts, Ian dug down 2' then used cement powder that you then pour water into and it sets! Then the box was fastened to the posts with some framework the next day. It's a heavy box and even heavier with books in! And one in the pub, another great idea, Jaycey! "they got a free piggy-petting session"
Oh my goodness, what a bonus! It was so cool to see that little barn red library on a post, just like in the pictures. I wonder how much "traffic" it gets. This is not a walking-friendly area, except for just around your own little neighborhood. Everyone drives everywhere. I counted 37 in our metropolitan area, but most are in areas that are organized city-like, ie walking-friendly with a large, connected street grid.